Many manual transmissions will be married to stock as well as conversion engines, and a custom pilot bushing will be required in many instances. 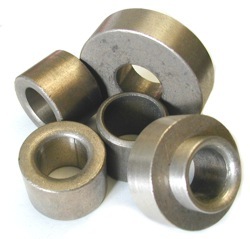 Predominately, these bushings are bronze alloys are impregnated with oil to arbor the pilot tip of a transmission input shaft. Some less common versions may use greased needle roller bearings (there is no real overall advantage to either style). Pilot bushings provide precise, lubricated alignment while the clutch disc is released. Failure to use the proper pilot bushing can severely damage the transmission. For more details, read our informative Guide to Clutches, Linkages & Bellhousings. For a bushing not listed, contact us. For custom or unique applications, let us know the specs and we'll see if we can provide you with a solution.